I bought my property in East Poland, Maine in 1990, the year after I moved to Gettysburg, Pennsylvania to join the faculty at Gettysburg College. The house would be my Maine retreat, keeping me connected to friends and the beloved Maine landscape and providing a quiet haven for writing and relaxation. I have always been an outdoors person, and the surrounding woods and the house’s quiet location at the end of a rural dirt road attracted me as much as the good condition of the house itself. The previous owner was a woman who had taken meticulous care of the inside of the house, but who was much less interested in the outdoors. 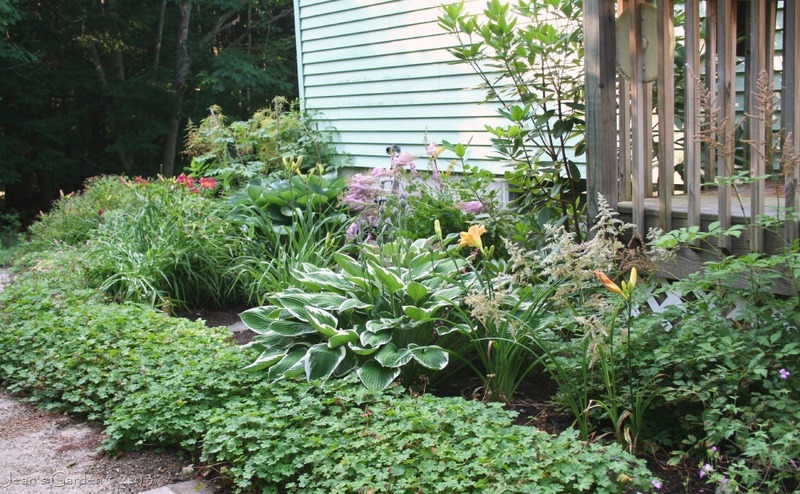 I bought the house in winter, when the property was under a blanket of snow, and in spring I learned that the cleared area around the house was a scrubby “lawn” of weeds and moss decorated with a few specimen shrubs. I also learned in spring that there was no easy way into the house from outdoors. The four-room house sat on top of a rise that sloped up steeply from the driveway; a door at the end of the driveway opened into a full basement. It turned out that the previous owner had always entered and left the house via the basement (also the way I had entered with the realtor). The “front” and “back” doors (both of which faced the front of the house, one leading into the living room and one into a mudroom off the kitchen) were reached by scrambling up the slope from the driveway and were each served by a narrow flight of wooden steps pushed up against the foundation. These steps, seldom used and not maintained, were rotting, as I learned when one gave way under the weight of my new refrigerator as it was being delivered. I moved into the house in May and my personal journals from the period show that, while much of my focus during my first summer in the house was on the outside, it was not on gardening. My first priority was to lay out a flight of stairs up the sandy slope from the driveway to the main level of the house. One weekend, my parents drove up from Massachusetts and my father provided the expertise and much of the labor to build the steps. The following summer, I hired a carpenter to replace the rude and rotting steps at the front and back doors with more substantial entry decks and stairs that were actually attached to the house. During one of these summers, I also created the first flower bed, which became known as the “back slope,” in an area that had been cut off from the rest of the “lawn” by the flight of steps up from the driveway. 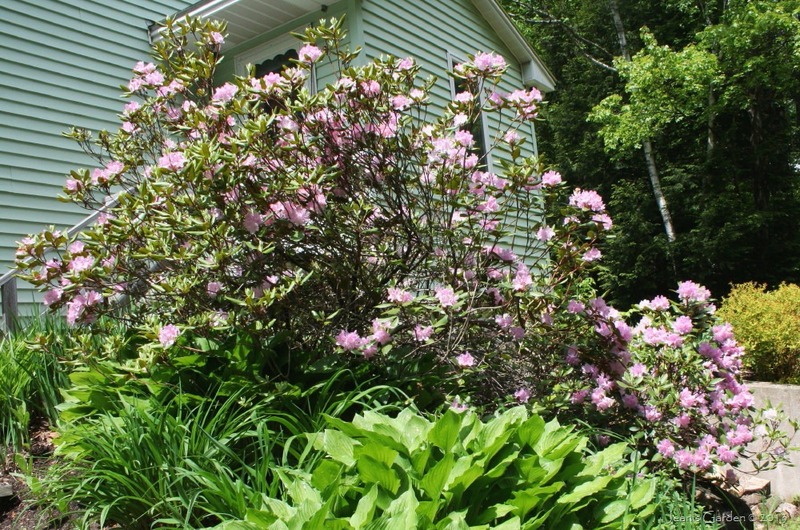 I stripped away the sod and planted, among other things, a division of rhododendron and several divisions of hosta from my mother’s garden; but there is no mention of either of these activities in my journal. 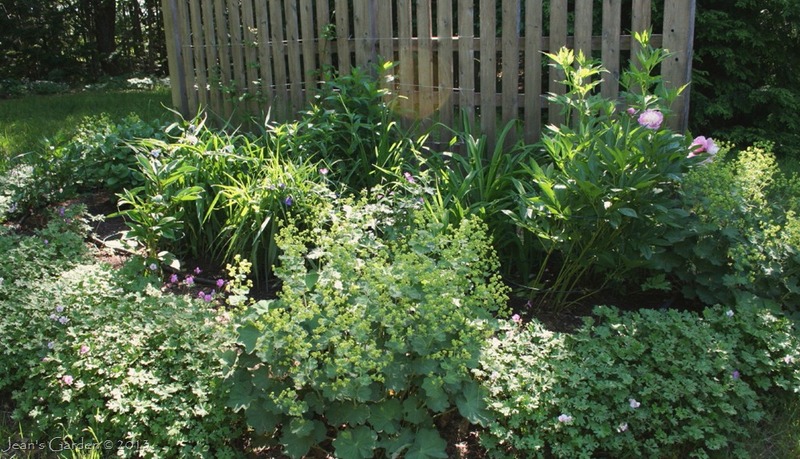 The first (brief) allusion to gardening comes in June 1992, when I noted that I spent a weekend “trying to get the outside of the house spruced up” and that this included creating an herb bed by the back door and planting annuals on the back slope and in flower boxes. I seem to have been bitten by the gardening bug this summer – partly, I think, because I am going to be here for an extended period … and have some time. My circular flower bed at the end of the driveway is a great success. I have also laid out the front walk and hope to get it finished next weekend. 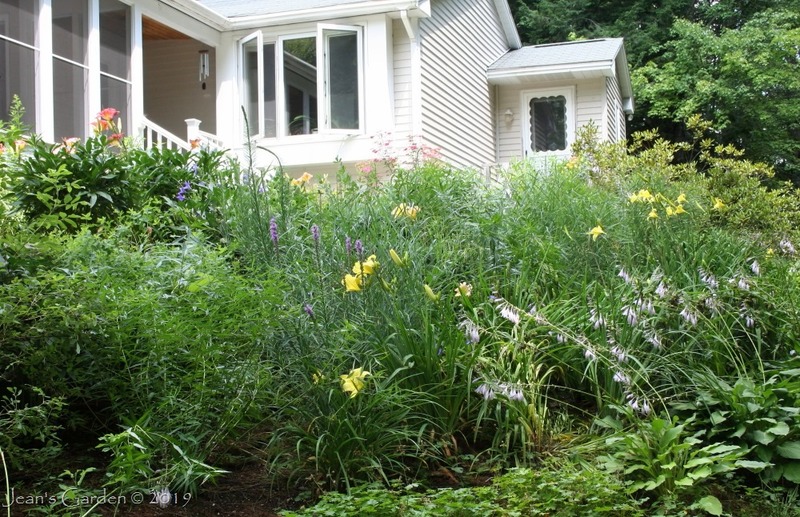 I have grandiose plans for fall: transplanting perennials, putting in a bed of irises in a semi-circle created by the front walk, planting wildflowers and lupine down by the well, and setting hundreds of bulbs. 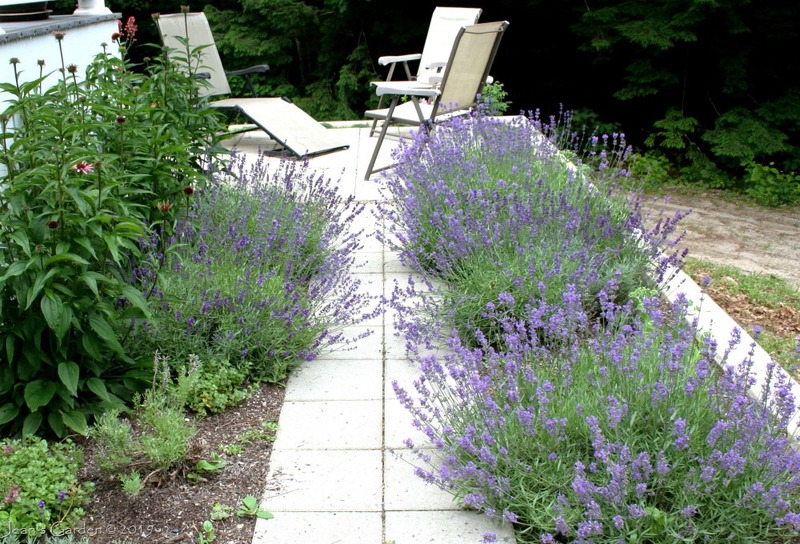 I can imagine even more: raised beds of cutting flowers in the front yard; perennial borders to frame a deck out back. In the months that followed, I dug two new flower beds, the semi-circular iris bed under the bow window at the front of the house, and a narrow perennial border under my bedroom window. 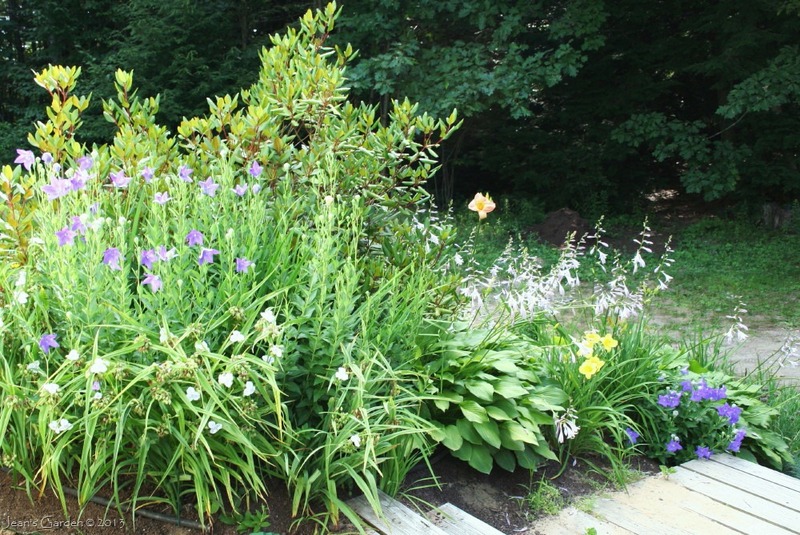 This was also the year that my friend Joyce gave me divisions of lilies, daylilies and Siberian irises from her garden. 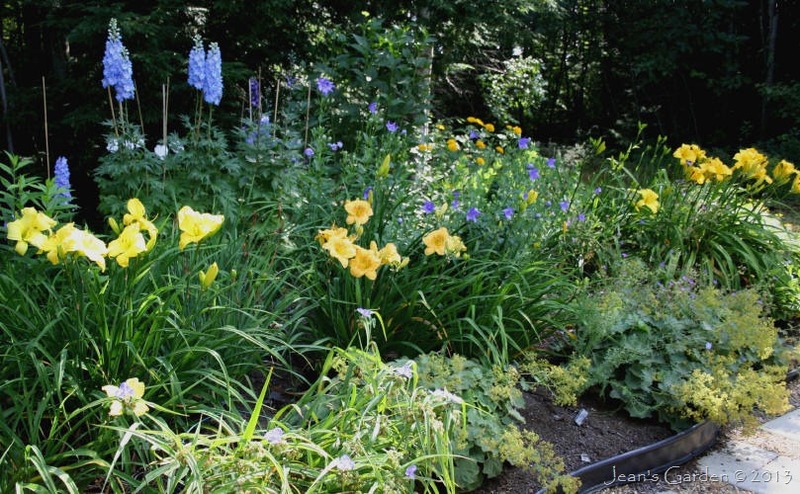 The Siberian irises were massed in the iris bed, and the lilies and daylilies were planted on the back slope and in the circular bed (beginning its transition from annuals to perennials). I ordered bulbs and planted many of them in the bedroom border (where I lined them up in straight rows like crops in a vegetable garden 😐 ). 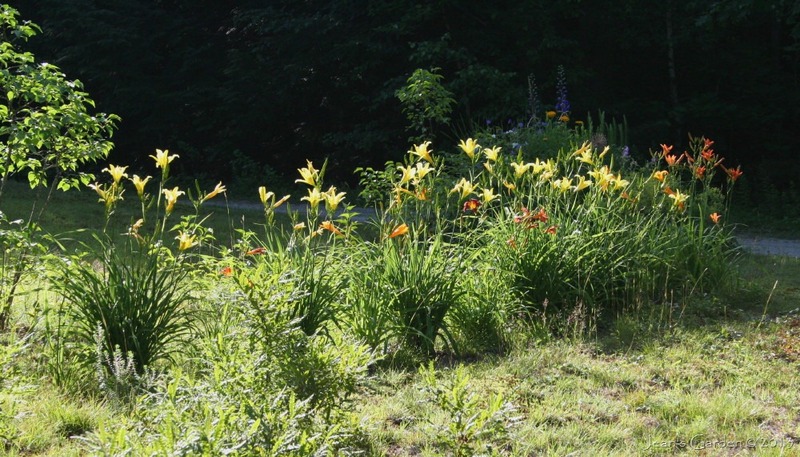 I never did plant wildflowers by the well or make raised beds of cutting flowers; but I did plant a row of daylilies along the front of the property by the dirt road in 1995, and I added a row of lilacs behind them in 1996. From the time I first moved into the house, I was aware that the most beautiful part of the property was the back yard with its view into the woods. And I was also aware that there was no easy way to enjoy it. I was also finding the weedy lawn behind the house a pain to keep mowed. By my third summer in the house, I had begun to dream of replacing that weedy lawn with a deck that would be reached by a sliding glass door from the dining area and that would also provide an entrance out to the back of the property. But this deck and any flower beds that might surround it remained in the realm of fantasy until 1999, when I was treated for cancer and developed a new sense of urgency about the passage of time. In fall of 1999, I took an unpaid leave from teaching as a time to heal from chemotherapy. 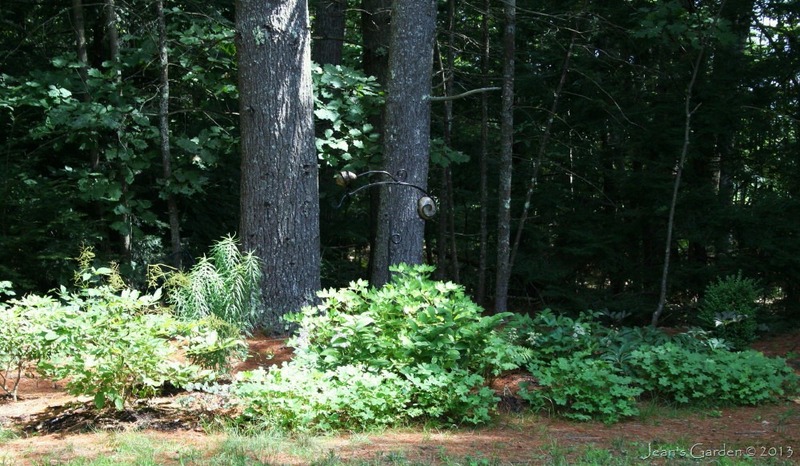 This extended summer and fall period in Maine was a time of personal renewal and reconnection with nature, and gardening was an important part of that process. Although I didn’t do anything about the deck during this period, my journals show a focus on the garden, as I developed a better sense of which plants would thrive in my conditions and redesigned existing flower beds. By summer of 2000, I was making serious plans for the deck on the back of the house and what would become the back garden, but my plans were thwarted by the difficulty of finding a contractor to build the deck. Most never returned my calls, and the few who did had no openings in their schedules for a year or more to come. In 2001, I did get one contractor to come and look at the project, but he never did submit an estimate. Nevertheless, inspired by visits to a whole new world of specialty nurseries that I had just discovered (see The Gardening Book that Changed My Life), I began to lay out the flower beds that would surround the deck and to dig the first section. In 2002-03, when I was on sabbatical from teaching and able to spend 15 glorious months in Maine, the back garden really took off. In 2002, the deck was finally built, most of the deck border was dug and planted, and the blue and yellow border was begun. 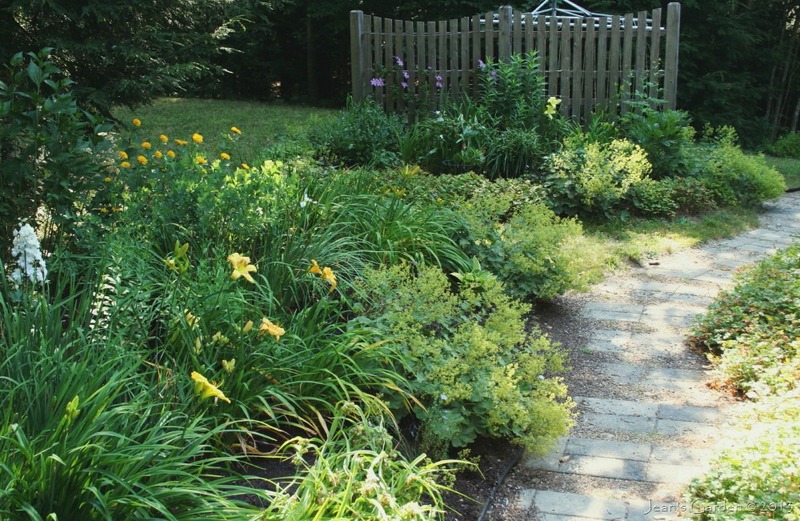 By the time I returned to teaching in fall of 2003, the deck border was complete and the even larger blue and yellow border, facing the deck border across a walkway, was about half dug and planted. 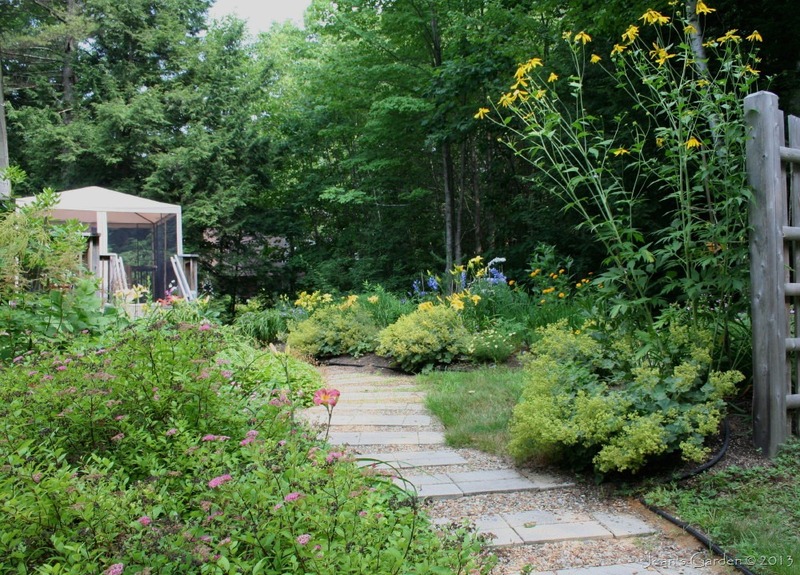 I finished the blue and yellow border during the summer of 2004; and in 2005, I began the project of building a curving walkway of paving stones set in pea gravel from the deck down to the driveway. This project, which included building a flight of garden stairs at the driveway entrance to the back garden, took more than three years to complete. 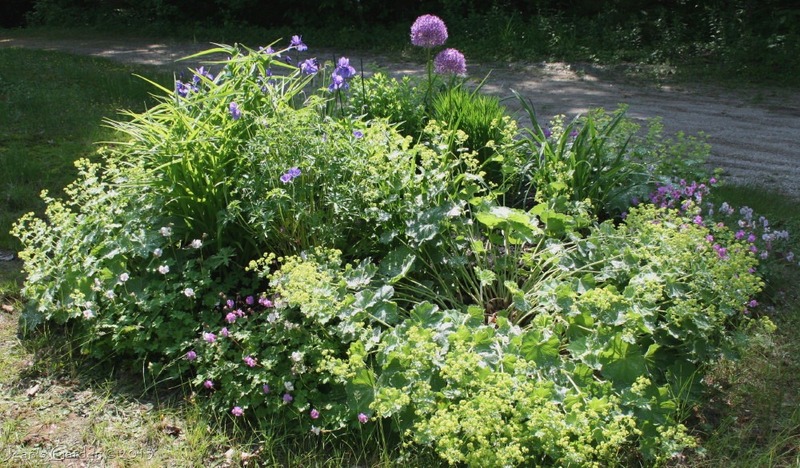 In 2005, I also redesigned the circular bed at the turn into my driveway (now primarily planted with perennials). I expanded its size from 5’ in diameter to 8’ and developed a new planting plan that incorporated some of the previous plants but that also included many new ones and that was much more coherent and pleasing. More than a decade after I began creating it, the back garden was still a work in progress. By the time that I had completed the blue and yellow border in 2004, I could already see that, from the vantage point of the deck, the garden looked incomplete. When I sat on the deck and looked out over the flower beds, my eye was carried past them to the clothesline, and I began to develop plans to install a length of fence that would screen the view of the clothesline and provide the backdrop for another flower bed. The walkway from the deck to the driveway was laid out with this new flower bed in mind. I finally had a 12’ length of fence installed to the garden side of the clothesline in summer of 2008 and immediately began work on the new fence border. This flower bed was completed in 2009. By the time I began digging the earth for the fence border, I had already begun planning for a new garden area, the Serenity Garden. Although this flower bed is also behind the house, it is separate from the back garden, located at the edge of the woods at the back of a clearing. The original idea to create a serene place for quiet reflection here was inspired by the secluded feeling of this part of the property – but that seclusion was disrupted when my septic system failed in 2009 and a new leaching field had to be dug this area, altering the landscape and necessitating removal of shrubs that had closed the area off from the clothesline and the driveway (see My Not So Secret Garden). After considerable preparation and planning (see Planning the Serenity Garden, The Plan, and Soil Test), I finally dug and planted the Serenity Garden in 2011 (see Birth of a Garden). In 2013, I put the finishing touches on this project by (1) building and planting a 4’ x 12’ raised bed just north of the clothesline to re-create the sense of enclosure and serenity that initially inspired this garden (see Closure), (2) installing a narrow path of stepping stones leading from the back garden into this area, and (3) installing a garden bench. 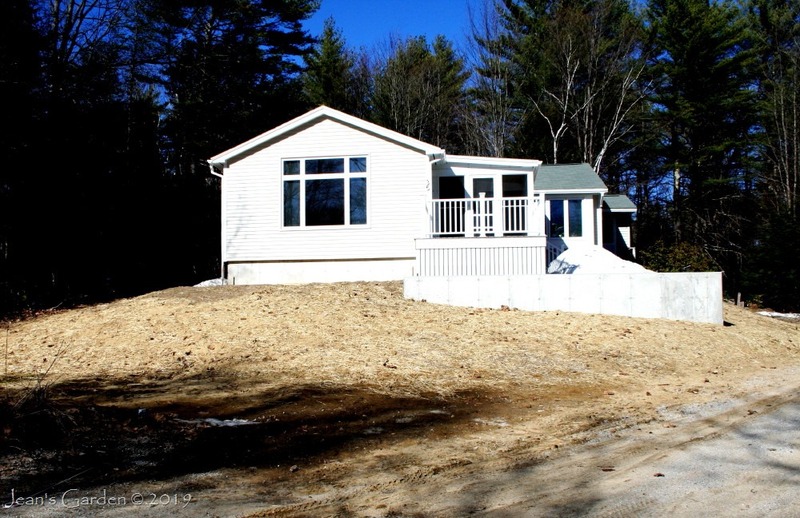 In 2014, I retired, made my Maine property my year-round home, and enlarged the house with an addition on the front. The new addition provided the opportunity for re-thinking the landscaping at the front of the house and creating a whole new front garden. Construction of the new addition was completed in April 2015, and work on the new front garden began in May. This was an ambitious one-woman project, and I knew the work would be spread over several years. In the first year, I focused on hardscape, laying 220 square feet of concrete paving stones to create a small patio and walkways (see Hardscape and Bones for My New Front Garden) and creating four small flower beds around those walkways (see First Flower Bed of the New Front Garden, The Porch Border, The Lavender Walk, and Mission Accomplished). In 2016, I turned my attention to the last flower bed defined by the hardscape, the Fragrant Garden, and to the large slope from the side retaining wall down to my driveway. I worked on the slope first (see Update on the Front Garden Project and The Side Slope: Mission Accomplished) and then did most of the work to create the Fragrant Garden (see Front Garden Project, Year 2: The Fragrant Garden). In Fall of 2016, I also planted several hundred crocus bulbs among the perennials on the Side Slope to create a spring display (see A Hillside of Spring Flowers). In 2017, the third year of my front garden project, I took a bit of a breather, with much less ambitious goals. I finished the planting for the Fragrant Garden, created a tiny rain garden to take advantage of the outflow of water draining from the roof at the front corner of the house, and prepared the ground and sowed seed for a wide clover path connecting the upper garden to the lower garden (below the front retaining wall) that would be the focus of my efforts in years four and five (see New Front Garden: Year 3 Progress Report and My Mini Rain Garden). In 2018, I ramped up my efforts with my most ambitious goals yet – to create a shrub planting at the front corner of my property (see The Shrubbery) and to prepare and plant the large slope between the retaining wall at the top and the clover path at the bottom (see Thinking About the Front Slope). I worked on these simultaneously, finishing the much easier shrub planting in June and continuing to work on the slope until I finished planting in mid-September (see The New Front Garden, Year 4: The Big Push). As I write this in March 2019, I am eager to see how the Shrubbery and the Front Slope will look this year when they emerge from under their blanket of snow. I’m also looking forward to completing the front garden project this year, with a planting of shrubs and perennials along the front of my property and a woodland-edge planting along the side of the clover path above the Shrubbery. Completing the new front garden will be a watershed moment. I don’t know if there will be any further big garden projects for me here. I do think about creating another shrub planting on the side of the house outside my study window, with a focus on spring-flowering shrubs. I also think about adding some woodland-edge plants along the side of my driveway. I am also aware that, during the half-dozen years my efforts have been focused on the new front garden, the flower beds in the back garden have gotten to look sad and in need of renewal. It is likely that I will turn my attention back to those plantings next year. Jack, Writing the history of your garden is a much bigger project — much bigger garden and much longer history! It took me a while to stumble on the strategy of dividing it into sequential periods in the history of the garden; I imagine that would work especially well for you. You have already written a lot of it in posts. I’m glad you enjoyed the shot of my little house in the snow. Your garden is absolutely lovely! I can appreciate the work that has gone into creating it, but it has certainly paid off. Gardens bordered by woods have that fairytale feel to them and the dappled sunshine in these photos is wonderful. I love seeing iris en masse too, and the blue and yellow flower bed is very pretty (or does it just stir me being the colours of my native Swedish flag, I wonder?). Looking forward to seeing the front garden develop! Sophos, Yellow and blue are my favorite colors; maybe I was Swedish in a former life :-). I am also looking forward to getting to work on the front garden. I have some ideas, but they’ll involve some earth moving. First I need to get the addition designed; then I can enlist the help of a landscape architect to lay the foundations of the new garden. Thanks, Donna. It was nice to finally find the time to get it written. Sandi, I love the delphiniums and daylilies, too; unfortunately, the delphiniums have been sulking for the past couple of years (possibly a response to being eaten repeatedly by the resident woodchuck). Lady’s mantle, on the other hand, is always happy to grow in my garden. So nice to see and hear about the progression…makes it seem possible, bit by bit. Thank you! No one who visits your garden will ever feel that duplicating it will be beyond their ability. There is a calming naturalness about it that is rather inspiring. After the blue delphiniums and the yellow day lilies, my favorite image is the path to what appears to be a gazebo. Allan, That second image is probably my favorite image of my garden; I used it as the cover image on my 2011 calendar. The gazebo is a screen structure that I put up on the deck each summer so that I can sit outdoors without being eaten alive by Maine’s infamous insect hordes. That’s the perch from which I most often enjoy the garden. A wonderful story of how a property became a garden through years of imagination, lots of work, and a deepening sense of place. 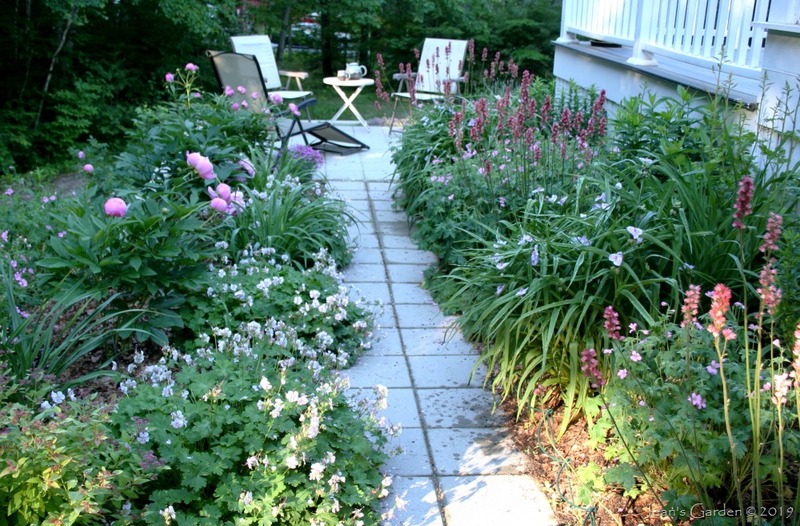 I love reading about how garden spaces are designed. Yours grew as you lived with it over the years and you are still altering it as circumstances change. I love how the plantings and pathway look all grown in. Kevin, I’m glad you enjoyed the “tour through time.” It occurs to me that my ambiguous syntax may have given the impression that I am retiring this year. In actuality, I have one more year of full-time teaching ahead of me. Nevertheless, as I make my retirement date official this coming week and, at least mentally, begin getting organized and packed to move away from my life in Gettysburg, I do feel as though I am already beginning this next chapter of my life. Jan, It’s so nice to hear from you. I’m sorry you’ve been having so much trouble leaving comments. A few months ago, I changed my settings to allow anonymous comments in hopes that would make it easier for you — but to no avail. I think that since, Blogger and WordPress are rival companies, they have no real commitment to making it easy for their respective clients to speak to one another. I go through periods where Blogger just refuses to recognize my WordPress open ID and I have to use my Google account to comment on Blogger blogs. Jean, this is a lovely way to intertwine you and your gardens, I am relly looking forward to read your ideas for the front garden. Lula, I do have some ideas for the front garden, but there are some design challenges created by the odd orientation of the house and the driveway to the road. Once I get an actual design for the house addition, I hope to hire a landscape designer who can help me figure out the basic configuration of the new front garden. I shall return to wander thru your garden history and savour each mouthful (sorry dinner is calling) – but yes I want to enjoy your iconic blue and yellow border again! Diana, I don’t believe anything I’ve done has ever been called “iconic” before :-). Thank you! 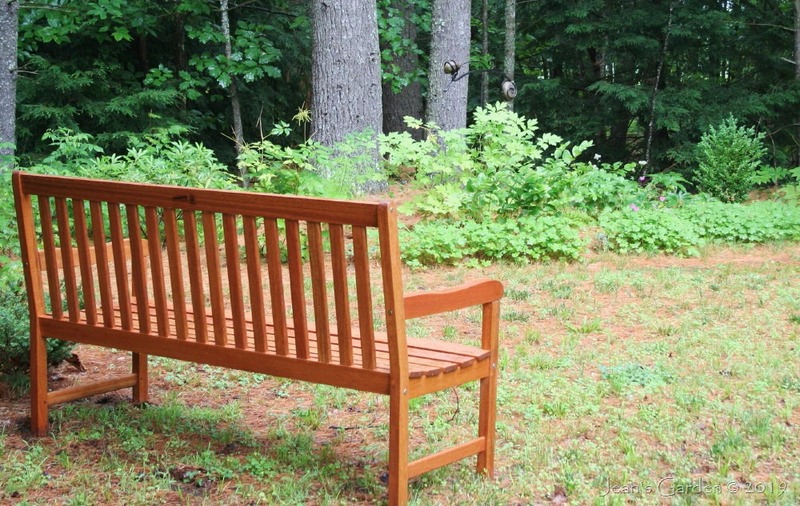 What a great idea for every gardener, but you actually did it—what discipline. Carolyn, LOL, I am nothing if not disciplined. I did enjoy putting all this together. Jean, I was completely captivated by your Maine garden chronicles. The way your surroundings went from nothing but grassy sprawl to lush borders is so inspiring. Your story illustrates how important it is for new gardeners to realize that gardens don’t happen overnight. They take years to settle in and mature and as you so aptly show, they’re always in flux, always evolving and devolving, always needing the human touch to keep them looking lovely. Beautifully done. One suggestion if I may, more photos! As you described your deck and steps up to your doors, I couldn’t quite visualize what you were trying to convey. This is not a criticism of your writing because it was very good. I just think I would have understood it better with the photos to go with it. Again, just suggestion. Now you’ve inspired all of us to attempt the same feat. Thanks dear friend. Grace, Thank you for your comments. I would love to have more “before” photos, but for some reason I was in stage of not taking photographs during the 1990s. I didn’t really start taking photographs of this property until I got my first digital camera in 2008, and by then most of the existing flower beds had already been in place for years. 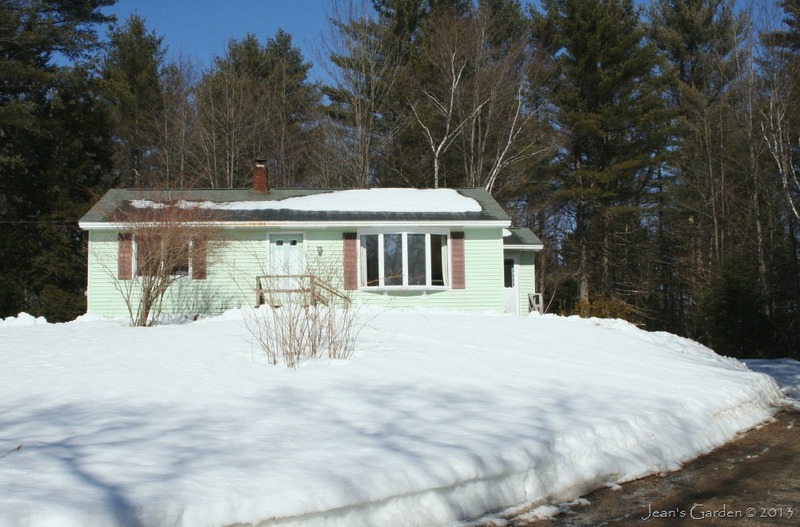 That first image of the property as it looked when I first saw it was actually taken 18 years later; but the snow and the angle hide any of the plantings I had added in the years between. One of the benefits of blogging is that I’ve done such a better job of chronicling the last few years in photos. I intend to take ample before, during and after images as I embark on my new front garden project. Love the before and after photos! I’m very excited to be starting a big backyard project this spring. I just talked to the landscaping company this morning and hope to start in a month or two. Woo hoo! VW, That sounds so exciting. I am hoping to work with a landscape architect or an landscape designer on my new front garden because I’m hoping to have some serious earth-moving done to lay the foundations of the garden. I found this post so inspiring. You’ve done so much with the garden since you moved in – the transformation is amazing. I will think of you when I look at my yard and want to quit because it’s all so overwhelming! Sarah, I think if I had known when I started how much work it would all be, I wouldn’t have started. But because I have done it bit by bit, it didn’t seem like so much work. And, since I used to think of myself as creatively challenged, it’s very satisfying to see the mature garden and know it is my creation. I love this page! I’ve been organizing my pictures in hopes of doing something similar (though my garden doesn’t have as a rich a history). For the last couple of years I haven’t even been able to post regularly, but you’ve inspired me to get try a little harder! Ginny, I’ve been thinking about this page for about a year, since I saw a similar page on another blog and was inspired. I did a couple of posts along the way (especially my late December post on my re-reading of my journals) that were steps toward this page. I think you should go for it! Your garden is so beautiful and what a lovely idea to organize the history this way! I have collected relevant posts on a page but without narrative. Will have to fix that sometime. Shirley, That is exactly how I started; this post is mostly a reorganization of information and images that are scattered through my blog in other places. I’m very pleased with how it turned out. Jean, I am very impressed, and not only by your beautiful garden itself, but by this very well organized story of the garden! Also, I appreciate the Search button. Looking at you, I added it to my blog and I’m very glad that I did. Now, I can easily find everything I need in my own posts! Thank you! Tatyana, LOL, “well organized” is my middle name. I’m glad to have helped you discover the uses of having a search button on your blog. The funny thing is that I’ve never thought of using it to find old posts; I almost always use either the categories or monthly archives for that. Thanks for teaching me a better way to use the features of my own blog :-|. Molly, Thanks for visiting. I know what you mean about wishing after the fact that you had kept track of things. I also had plans that I made for the planting design for each flower bed, but I had to try to reconstruct when and where I bought various plants after the fact. With the new work on the front of my property, I am keeping a careful photographic record so that it will be easier to compare before and after and to document the progress along the way. I would love to have you come and visit sometime (although not this year when I am living in a construction zone). Where are you in Maine? Thanks for replying. I am hoping the weather holds out so I can prepare gardens for re-constructing next spring :+). I am in Randolph, right next to Gardiner. Would certainly contact you b4 visiting some time hopefully next year. Have a great Fall and Winter and enjoy your retirement. Now that you will be your own “Boss” you will be busier than ever. I’m just begining my adventures in planting (we just purchased our first home) and felt wistful looking at your beautiful gardens. I only hope that some day I will be able to create something so beautiful. Thanks for the inspiration! Wow Jean, you inspire me! Isn’t it fun to look back and see what you’ve accomplished. Happy gardening (or dreaming about it). While I was aware that you’ve worked steadily on improvements to your garden, I’d no real idea of the breadth of these efforts until I read this history. What a tremendous transformation, Jean! Gardens are never “done” (as I’ve been reminded several times recently) but yours has gotten better and more interesting with each iteration. Kris, I’ve often joked that if I ever actually finished my garden, I’d have to put my house on the market and start over somewhere else. It was garden blogging that taught me to plan the view from each window. Still a work in progress, but so rewarding each time you look out. Diana, It’s when I’m sitting at my computer looking out the study window that I start dreaming about what I could grow there.